The entertainment industry has long evolved from its primary stages of struggling to an advanced age. Events and concerts are happening all around and people admire taking part in such as well. An event management system is a crucial factor, which has a significant role in managing and organizing any events despite their size. Keeping with the spirit, Agriya introduces an elegant event booking solution, ideal to develop a comprehensive event management platform, particularly in a short time frame. A comprehensive event management system has become the cruciality because of the overwhelming number of events happening around us. Moreover, to manage and organize large crowds, you need a much effective ticketing system. Agriya’s online event booking solution incorporates several inventive features to make it easier for users to complete their operations. The main objectives of an event management system are to help businesses systematize their functions and to help users manage their tasks efficiently. The compelling UI of Agriya’s online ticketing solution allows users to seamlessly book the tickets. Simplified workflow enables them to complete their tasks in no time. 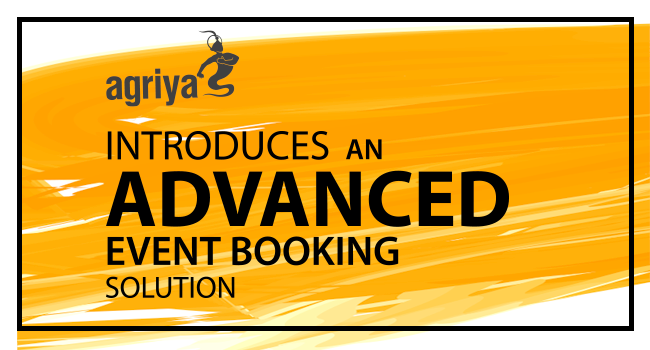 Booking being the sole reason for an event booking system, Agriya simplifies the booking process and thus enables users to book their ticket with ease. Advanced seat mapping feature lets them choose the appropriate seat considering the price, availability and more. Besides, they can hold their tickets in the cart for a brief period of time. Users can change their language settings to conveniently use the platform. By integrating a feature that supports numerous languages, Agriya’s event booking solution guarantees a much flexible, localized experience. The most important phase in ticket booking is payment and integrating a secure payment gateway demands utmost significance. We incorporate Paypal, the most reliable, trustworthy payment gateway to safeguard the money transactions. Agriya’s foremost event solution is business-focused and has the best intention to facilitate them through flawless functionalities. It helps businesses attain great freedom and control over their process by taking advantage of its futuristic mode of approach. Revenue is crucial for businesses in each and every step of their progress. This full-fledged ticketing solution involves diverse revenue generation possibilities, which is designed based on profound industry research and analysis. Admin is given a feature-laden dashboard to streamline the business operations. It helps them have a transparent view of entire process happening on the platform. It facilitates them to manage both front-end as well as back-end operations. Utilize automated analytical insights to have a great understanding of how your platform works, how the customers behave and further take a logical decision that helps you sustain. Admin can send real-time updates, thereby notify users expeditiously. Users will receive a confirmation message along with the ticket and venue details as they finished booking the ticket. Apart from the easiness, it brings to communication, Email templates saves a great amount of productive time as well. There are certain stereotype situations that will happen with every business. And to handle this situation every single time is time-consuming. Pre-built templates allow business to tackle these situations before long and more efficiently. To bring more efficiency to the operations, admin can split their duties with organizers. Thus by segmenting the entire business process, you will get more clarity on the process going on within your platform. Agriya’s ready-to-deploy ticketing solution assures comprehensive support for any event businesses by automatizing the entire process. And since it is compatible with all kind of devices, it satisfies all kind of customer expectations. By integrating this impeccable solution, businesses can simply set up a customized online event management solution.